I have not been on vacation, but maybe I should have taken a break. This month has been full of pitfalls…mostly self imposed pitfals but pitfalls none the less. 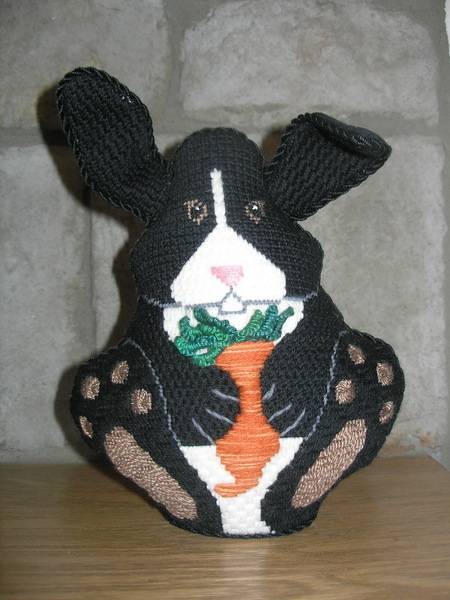 On a bright note, I have finished stitching Mr. Bunny. He will not make a the Easter Parade this year but next year will be decked out in his finest for the day. Stitching the background for this is brought up a thought to me. When you are choosing that painted canvas do you know exactly what you want to do with the completed canvas or do you just buy it because you like it. 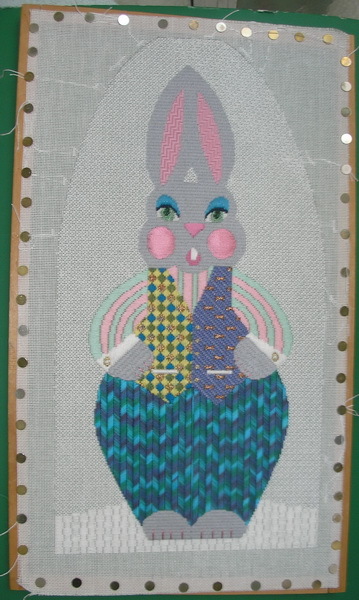 I have been giving a LOT of thought to this since stitching Mr. Bunny. 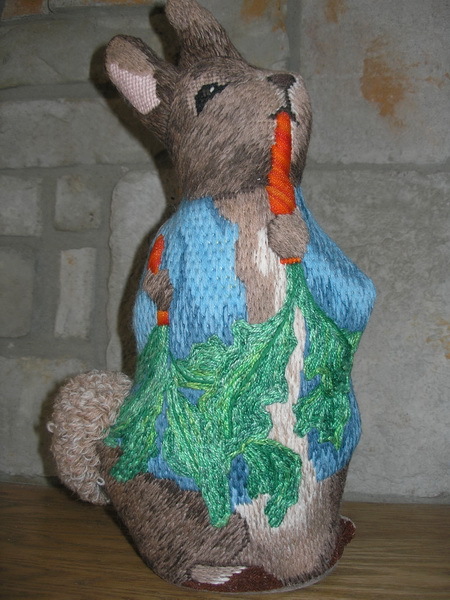 As I was stitching I decided I want the bunny to be a stand-up, but what kind of stand up: A form shape, a dome shape? At first I thing I would like a form shape but then I was afraid he was so tall his head might look like it was falling off the back of his shoulders So I decided to do a form shape. But after I drew a dome shape around Mr. Bunny and stitched the back ground, I thought the same thing would happen unless I decided to finish the piece as a boxed form. So a box form he will be. The other thing I noticed is no matter how I finish this canvas there is not much canvas left (especially at the top for blocking.) 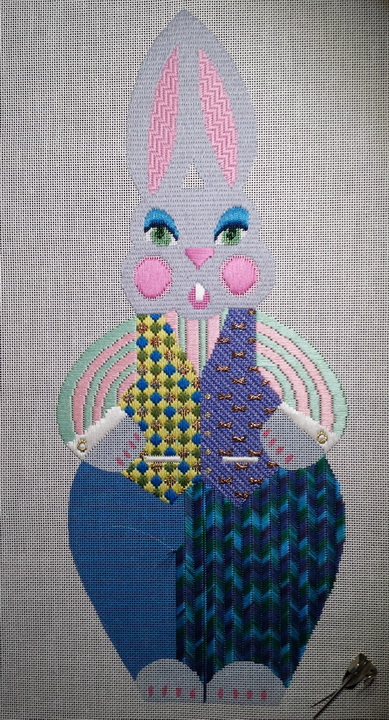 I only stitched out one inch from Mr. Bunny’s ears and hips, I would have liked to do more but I needed to leave something for blocking. I know this is a cost issue for designers and painters and also for us as stitchers. Designers would have to charge more for extra canvas and we would have to buy larger stretcher bars but in some cases I wouldn’t mind the extra cost. I will block this piece myself and I am even going to try box finishing (never done before…any hints or suggestions will be appreciated.) But I think other finishers might have liked to have another inch or so to block. And this brings me back to my original question: When you are choosing that painted canvas do you know exactly what you want to do with the completed canvas or do you just buy it because you like it? I think that this is one of the reasons we have canvases we never stitch…It was so-ooooo cute in the shop; we just had to have it. So we buy it take it home and later we are looking for something to stich and we don’t chose the canvas that we are unsure how to finish. So I challenge all of you consciously think about that next canvas; how do you see it finished? If you cannot answer that question look for one you can see as an ornament, a picture, a pillow, a stand up, or a purse. Because not only does the canvas you choose depend on how it will be finished, the threads, stitches and embellishments you choose also depend on how you finish the canvas. And with that said I should have taken my own advice and never picked up the next project! I found an UFO in my closet that on hindsight was there for a reason but I had a two week moment of bad judgement. I let myself talk myself into finishing a doomed project. Let me preface this with the fact that I envy anyone who can knit…I want one of those beautiful sweaters I see my friends knitting. A friend told me to go take knitting classes and I almost tried this ill-fated project, but instead I found this unfinished crocheted jersey in my stuff. So I figured Iwould finish it and then think about knitting classes. I have spent two weeks stitching sleeves and putting this jersey together…Oh what an ugly thing it is! Way too big and falls off my shoulders….not to mention the weight (and its all cotton)…and then there is the cost…I venture to say I could have almost purchased a NFL team member’s actual jersey! 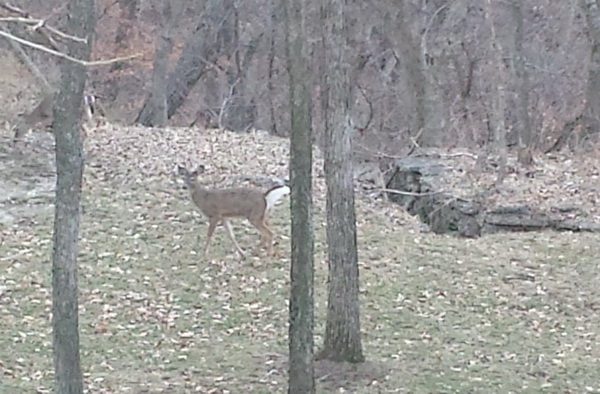 Well, not quite, but I could have purchased a NFL jersey they sell at the local sports shop…and a nice one too. And the other setback I had this week was I upgraded my graphics program and now I can’t open the old one. The new one is enough different that I am going to have to spend a few days looking it over before I need to do work for teachers and designers. It’s getting to be that time of year when teachers are getting their new classes together to pilot to some of you lucky stitchers. I am not taking knitting classes, I will just continue to envy all those of you who can multi task. I am a graphic designer; I can make nice diagrams for myself, teachers and designers. I have so many ideas that I will never get them all tried. I can sew; I can make some simple clothes for myself. And I can finish some needlepoint. But Most of all I am a Needlepointer! I do it fairly well and I am sticking with it! But I am going to look at each canvas I get with a critical eye and decide how I see it finally finished. 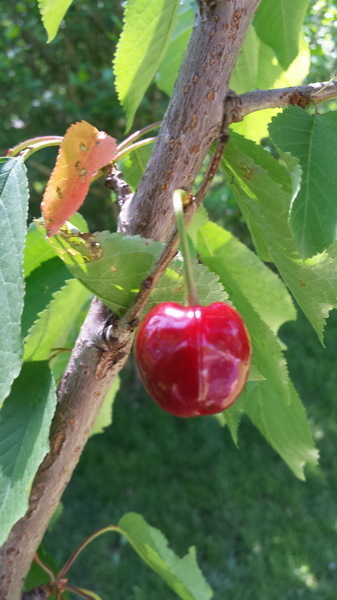 And things are looking up…We planted two Bing cherry trees last year and this year one tree had ONE cherry, it ripened, I ate it and it was candy sweet, oh so yummy. And the other tree has a bumper crop but not quite ready for harvesting. 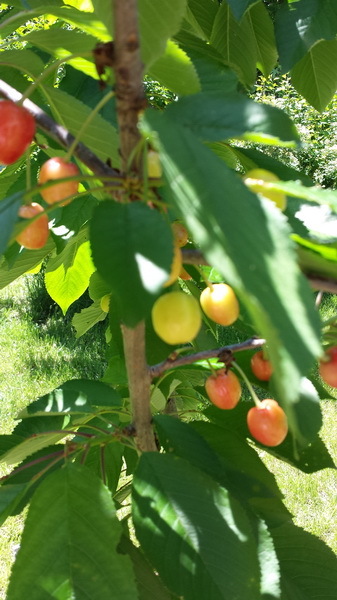 I sure hope next year we have more cherries on both trees or I may have to replace the one that is producing stingily. But for now this needlepointer is off to stitch. I have picked a new project and threads; I know how it will be finished. I am going to pick stitches and just have fun! 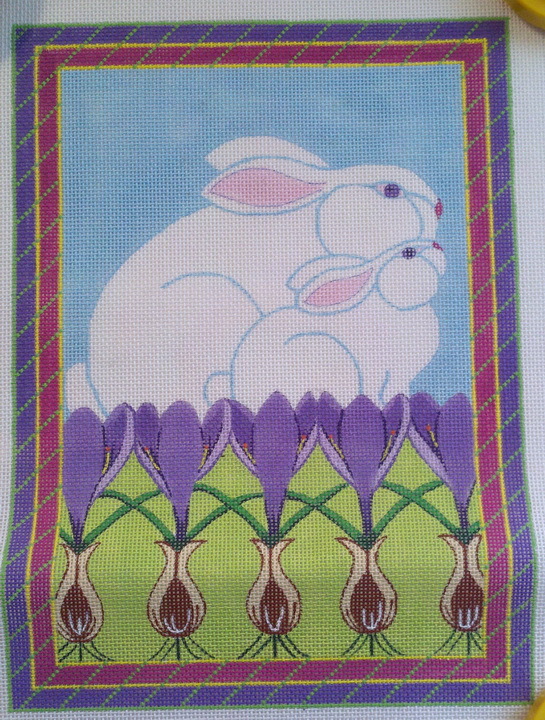 I am finishing up a Easter project and I got to here and was out of thread. I happen to have an extra skein (same dye lot) but I am lucky. How many times have you gotten to here and not had that extra skein? What to do if you didn’t notice until the bitter end? It is its own self-contained area, isolated from other areas of gray stitching. The area has is slant different from the other paw and slanted not like the feet or head. Also in this case if the gray dye lot was noticeably different (bummer) you still could salvage the stitching by removing both paws and re-stitch with new dye lot. But what do you do when the area is a large area and you run out of thread? Don’t throw the piece away, there may be some good solutions. You can try and ask the needlepoint community on line if anyone has another skein of your dye lot. We are a fairly friendly and honest group and love to share. I always check when someone asks…usually I’m a day late and a dollar short…someone has beat me to a random act of kindness already. If that fails you can get another dye lot and hopefully the new dye lot is very close. I also hope you realize the lack of thread before you have used every last inch because you can start stitching with the new dye lot every other thread until the old is gone and then finish up with the new dye lot. 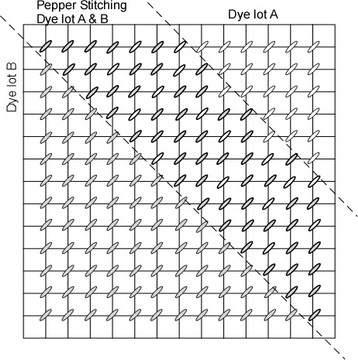 It would also be nice if you were using a stitch other than Basketweave….Basketweave is not very forgiving when it comes to new dye lots but you can “pepper stitch the area and then fill in with new dye lot. You gotta do what you gotta do. But what if all else fails and the dye lot is so different you are about to give up…Wait, look at the canvas a try and find a cutoff place. Hopefully you are stitching a background or large area and have enough thread to cut off so it looks planned. Then look at the canvas, pick a stitch very close to the original. 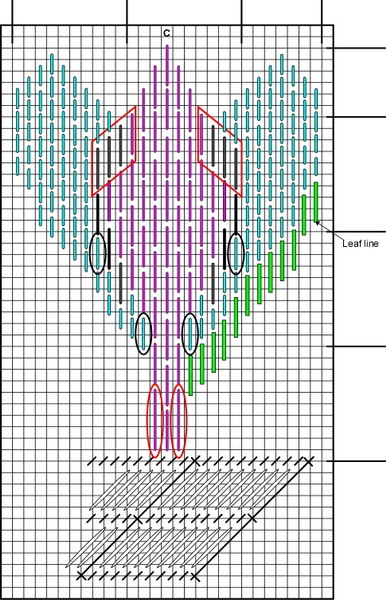 Example: stitching with Mosaic using dye lot A, use a Reversed Mosaic or Continuous Mosaic and stitch with dye lot B. My best advice is when purchasing the threads for a canvas buy one more than you think you need for large areas. Life happens and if the canvas and threads gets pushed to another days stitching you will be covered. 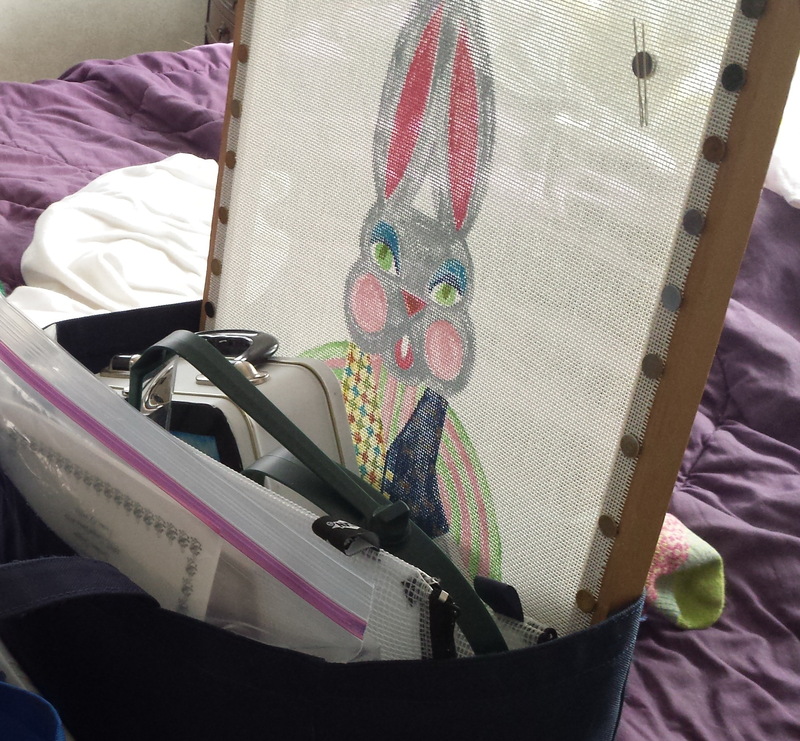 This bunny had 4 skeins of gray…I will have most of two left over and 3 skeins of overdye used in pants (Using overdyes are a post all their own…will leave for another blog day. ); I have parts of all three left. I just spent the most relaxing week. I was house sitting my niece’s dogs….it’s a tough job but someone has to do it and I’m so glad it’s me. Usually I take a have computer project to finish, but this time I took nothing but a painted canvas, threads and a stitch guide. But that I want to thank all those people out there who take the time to figure out stitches for painted canvases. It is so relaxing (like stitching a piece of basketweave). All you have to do is pick up the thread, look at the diagram and stitch. I’m not saying that if Sally Stitchguider has suggested Bulllion Stitches using Marlitt thread (so glad this thread is gone) for hair that you must follow her suggestion…I personally think Sally Stitchguider was having a bad day and I would use loose French Knots with floss first. BUT for the most part these fine people have a working knowledge of what they are doing and are usually right on the money. They keep abreast of all the new and exciting threads on the market and try to incorporate them in their guides. They know what stitch works best with what thread and they don’t have to experiment around. 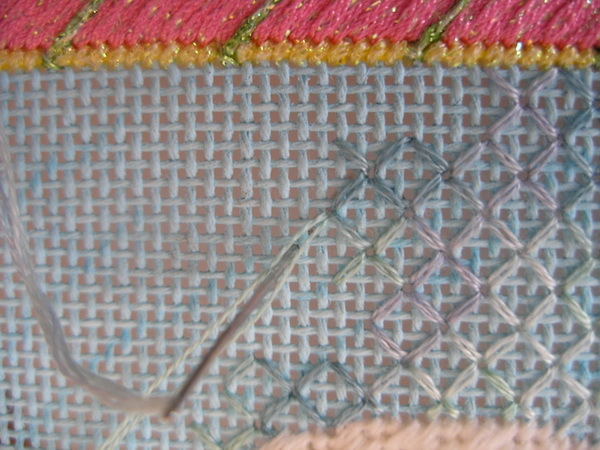 Keep in mind there are several types of stitch guides. And not all stitch guides are created equal. Some stitch guides are written for a canvas and the shop that sells it. This means that all the Blue Dog canvases that Shoppe Around the Corner sells will have the same stitch guide for Blue Dog. 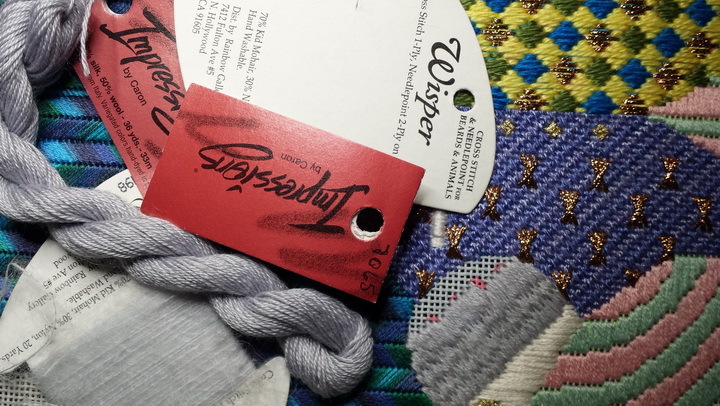 The stitch guide writer knows the threads that Shoppe Around the Corner stocks and will use them in the stitch guide. Some designers pay stitch guide writers to write stitch guides for their canvases. Some will sell these at an additional cost to the canvas, some other designers will include them in the price of the canvas. This means that Debby Designer’s Pink Cat canvas will have the same stitch guide no matter where you purchase the canvas. And then there are the canvasses that you ask to have a stitch guide written for you. Depending on what you expect you can plan on paying from $0 to $600 (highest I have heard so far). Some shops will give you free thread and stitch selections if you have purchased your canvas at their shop, but don’t expect a big written out booklet…remember you get what you pay for. Keep in mind, you are asking someone to spend time writing a guide for you and so if you do get a booklet complete with threads and stitches, Sally Stitchguider has a business too. My stitch guide came with the painted canvas and threads (the threads were extra but could be purchased as a kit too. ) I seldom stitch a painted canvas with a stitch guide and threads already chosen for me, but I picked this up at a guild sale and decided to stitch it. I usually like the challenge of choosing my own stitches and threads and usually make it up as I go. I approached it like a class project and so I first read the stitch guide and checked the threads to make sure I had what I needed. There were a couple thread substitutions (but that happens), so I made the notation in the instructions and then I started stitching. I started with area #1 and picked the thread out of my thread packet and began stitching. The guide suggested Encroaching Gobelin over 2 threads and I tried it but didn’t like the look. 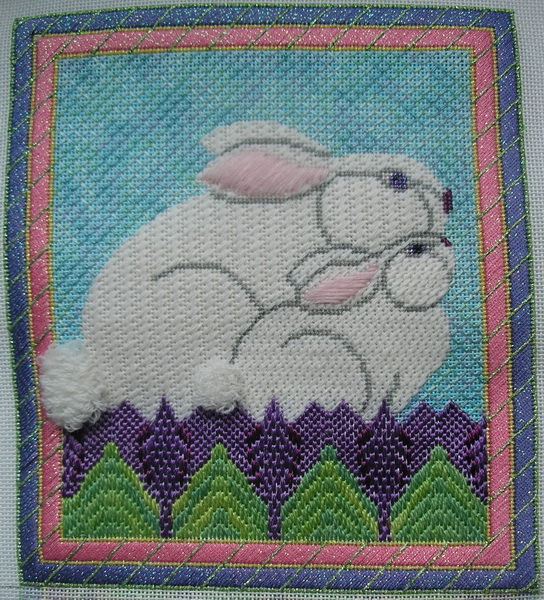 I thought the bunny to large for such a small stitch so I “frog” stitched the area. But in keeping with the stitch guide my adjustment was an Encroaching Gobelin over 4 and encroached 2 threads. This was so relaxing and then I realized was not looking at other areas of the canvas to decide what stitch I might want to place in various areas. It was so mind relaxing. As I was stitching the mouth area in basketweave I realized that if I stitched the tooth n basketweave also it would recede into his mouth to far to please me so another stitcher’s choice to wait and use straight stitches for the tooth and I stitched the tooth area twice to make it padded. I also have decided his cheeks need to stand up some and so instead of basketweave here too I will make padded satin stitches…I did the same with his nose. I started stitching his ears in a 4 by 6 Byzantine…not sure where it came from but it was not the Diagonal Mosaic that was suggested. I realized without thinking I was stitching without checking the stitch guide and so I got back on track with his vest. Even though the canvas was painted with a smaller check I followed the pattern in the stitch guide. I’m not sure I like the metallic I don’t think it covered as well as it should but I tried another copper silk and wool but I didn’t think it had the sparkle that was needed. The pants are stitched with the thread and stitch that is suggested in the stitch guide. You are supposed to use four ply of the strand to stitch the diagonal rows. I think you were given more than enough thread to do this; there are three skeins of overdyed floss in the kit. I think you could stitch the pants without combining any of the leftover two ply, but it seems like such a waste of thread. And so the Scotsman in me made yet another executive decision, I would stitch the reversed diagonal rows using a random 4 ply of the leftover two plies. To ensure I had a random pull I pulled separated 3 strands and randomly put them all together before I stated stitching the reverse diagonals. It seems to have worked out so far and I like the effect it gives. We will see how frugal I was when I complete this area, if I have less than 6 ply I will have figured accurately. I’m almost done with the bunny and so for this Easter may just set him up on the stretcher bars for everyone to enjoy. I plan on giving bunny a background stitch and then I have an idea for finishing but then I have another year before Easter rolls around again. 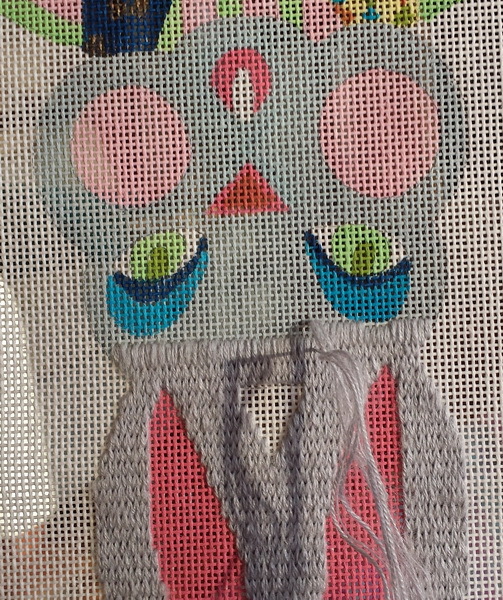 I stitched the ears with Pink Whisper and Angora and I’m sure that will not wear well as a purse and I really like the piece so now I’m thinking frame it or make one of those tri-stand folding pieces. Any thoughts? I also had a moment of inspiration and designed and stitched another piece over the week-end. I need to chart it and frame it and then will share with everyone. Sorry this is short and sweet but I need to get back to a stitch guide for a teacher or there might not be a pilot class this week-end. And we don’t want that to happen. I finished stitching the flowers and leaves and filled in the green leaf areas. I used an overdye for the leaf area and stitched one area at a time. I thought I would go from side to side across the entire piece but I did not like the look and so I frog stitched it out and tried one area at a time. 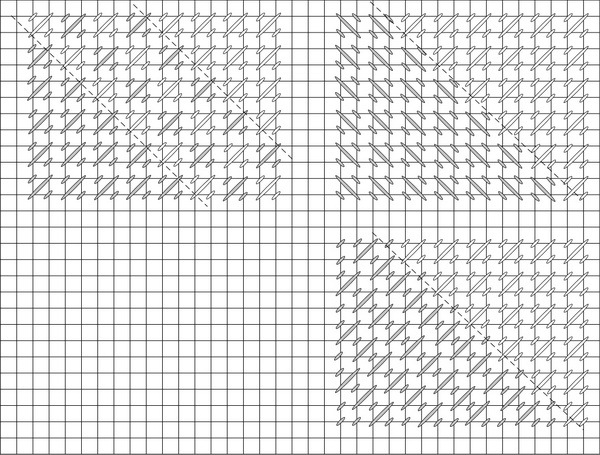 I tried to get each area alike but when I was finished I think the two left are similar and the two right are similar…oh well, it is stitched. Up close I am not impressed with the flower area but as you get some distance to the piece I do like the look and since I have a finishing idea in mind (more about this later) I think it will be fine. And anyway as my friend says, “If your close enough to my piece to see my mistakes; you are too close.” So if you are going to be this close to the piece you are too close. I have started the background and am using ThreadworX’s floss. I am puddling the stitches, I really like this technique for overdyes. Puddling keeps thread from developing a striped effect like you can get when you stitch horizontally, vertically or diagonally. The only thing I have found that I have to watch is making sure I don’t develop huge areas of one color. Some overdyes have a tendency to have larger areas of one color than another and if not careful you can develop large areas of one color. Helpful hint: cut out large areas of one color. Last fall I showed you how to stitch the puddle method with a continuous uncut overdyed thread, like Watercolours (https://sudukc.wordpress.com/2013/10/01/overdye-puddle-stitching/). With ThreadworX it is a slightly bit different because these threads are cut into given lengths of thread. 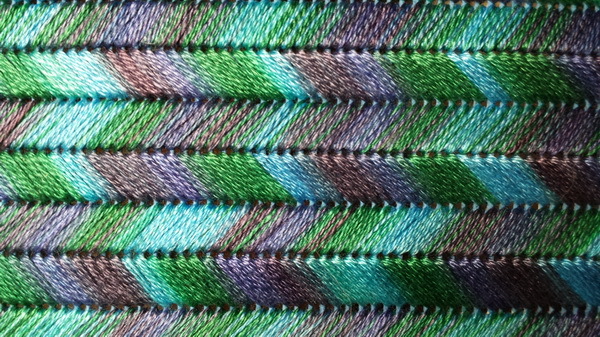 When you open a skein of ThreadworX’s and lay it out there will be an “A” end and a “B” end and it may appear the same as an overdye that has been cut from an uncut overdyed thread (like Watercolours). 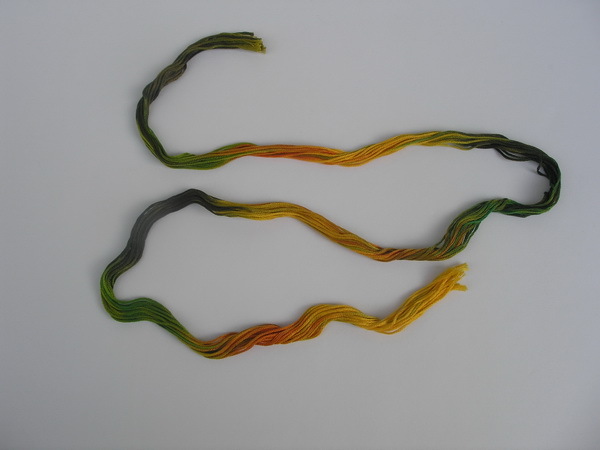 The difference is that ThreadworX’s threads are consistently similar where Watercolours may vary a bit as the skein is used because of the dying method. When I puddle stitch I randomly pull ply and stitch. I do keep “A” ends together and “B” Ends together; if you don’t then you will get a blended effect and that is another way to stitch with overdyes. For my purposes in this design I am keeping the “A” ends and “B” ends together in the needle…BUT I am randomly deciding which ends (“A” or “B” ) goes into the needle. Example: With one strand of thread, using 2 ply in the needle to stitch, there are three stitching lengths in a thread per strand: 2 ply A-B, 2 ply A-B, 2 ply A-B (Oh I knew those math classes in school were for something…remember those teachers that said you would use these principles in life?). I divide these threads and place them in three needles 2 ply A-B, 2 ply A-B AND 2 ply B-A. (it could have been any combination…remember that math week on variables…this is an applied use and for all you math geeks out there…it is 5 choices.) Then I pick a needle stitch with this needle, then I randomly pick another needle and last the final needle (and this variable greatly increases but I missed that day in math class.). I have no idea which is which (well I do but I don’t pay any attention and just stitch). I continue to do this throughout the piece. 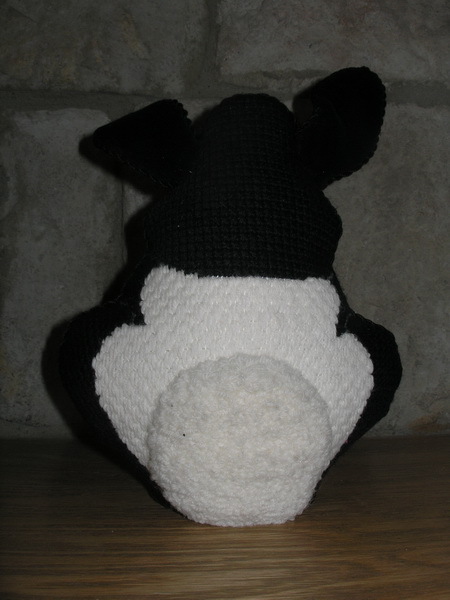 And I also vary the placement of the stitches so a pattern does not develop. Okay, Math class is over and I need to get back to stitching the background. For this background I chose a four way continental stitched over 2 threads…I wanted an open background that would allow the painted background to interact with the thread. I didn’t want to lay every thread and so I borrowed a technique from Cross Stitcher’s, “Railroading.” Railroading is where you place the needle between two plies as you return the needle to the back of the canvas. 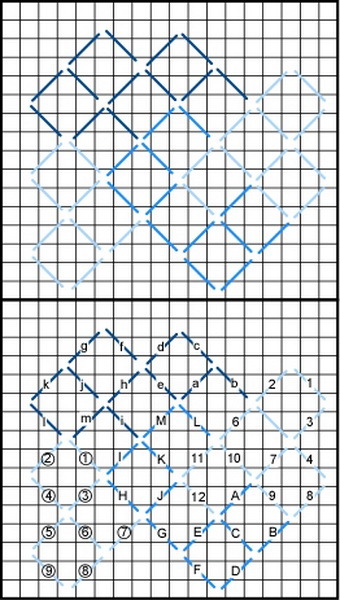 I have Cross Stitch friends who can do this with any amount of even plies (2-4-6) but I can only do it successfully with two ply and usually on longer stitches. You can see the technique in the picture. Hopefully next week will have it finished and then need to decide if I am tackling the finishing or sending it to my trusty finisher…Part of me wants to learn to do this and another part of me says you traded that sewing machine for a laptop and stitching. How many of you tackle your own finishing? These are three of my favorite rabbits. Hope everyone has a blessed Passover or Easter week. 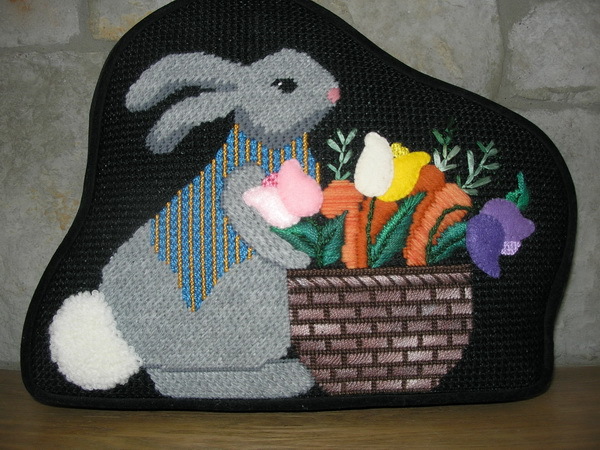 I have finished stitching the tulips and promise will post a picture and blog next week. Stitching is on hold for this project but will resume next week. 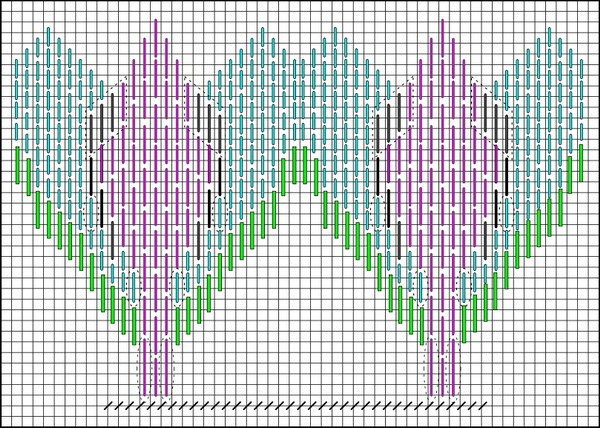 I have been computer stitching a couple stitch guides for a teacher….there are two great classes about to be taught. Thank you for stopping by this week and I hope you have time to stitch every day! I can hardly wait for the REAL flowers to bloom. I know they bloom quicker and with more ease than this border has blossomed! Yes, you can hear I am a wee bit frustrated but I think I have the hybrid in the pot now. It took me the better part of the week-end to get these flowers to the place I want them but I think I have it now and all that’s left to do is stitch them. 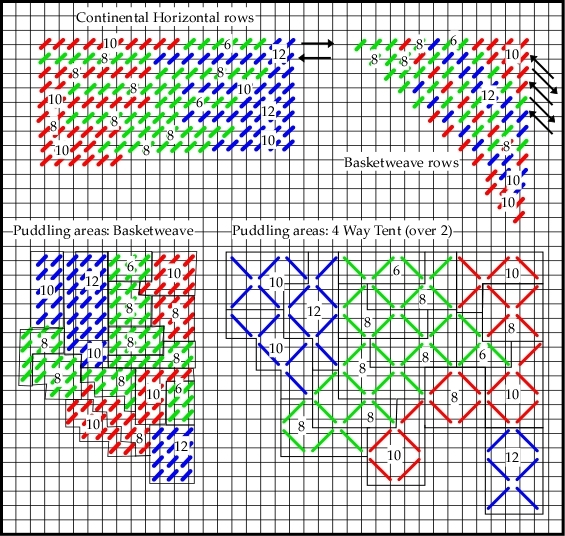 If you notice in the center diagram all the stitches are over 4 threads. 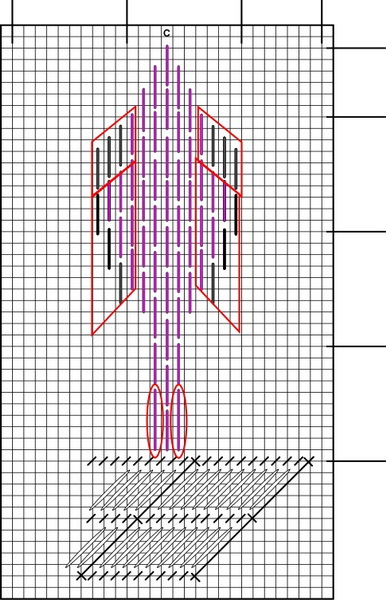 And most of the purple threads (purple lines) are stepped 2 threads up or down. The exception are the red parallel boxes where I made a mistake on the far outer purple stitch on the top left and only stepped up 1 thread so on the right I did the same (that makes it not a mistake but a planned stitch 😉 ) Then when I stitched the dk purple stitches (black lines) I decided that stepping up or down by one should be continued (this is called artistic planned mistakes) and so all the red parallel boxes are only stepped up or down 1 thread. I also do not straight stitches over a single thread and so the red ovals are stitches I make 1 thread longer over 5 threads (an artistic planned moment). I had thought the couter stitches should be over 2 but then decided that over four would be quicker. NOT, I tried stitching them over 4 threads and did not like …so-o-o-o I frog stitched them and went back to the over 2 threads. I liked this better and so after I stitched the left side I computed the stitches and then stitched the right side. Sould not listen to that left brain while designing! The black ovals are the compensating stitches I made to avoid the dreaded over 1 compensating stitch.